In June 2017 we received a phone call about a cat that had given birth under someone’s decking. We confirmed that we could take them in and so all our experienced foster mother Jeanne needed to do now was catch them, which was easier said than done. She caught one unsuspecting kitten but the other two were not going to be as easy and they dived back underneath the decking as soon as anyone arrived. It ended up that the house owners had to dismantle their decking in order to catch them! Finally she had mum and her 3 kittens safe in the cattery. Then the hard work began because the kittens had not been socialised or handled and Mum was feral. Eventually the kittens showed some progress and were rehomed to very patient owners who were prepared to continue the work we had begun to tame them.Mum was a different matter though and she ended up staying with us for 11 months as it is so difficult trying to find a good home for this type of cat. We had one offer but this fell through when Polly developed a bad eye needing veterinary treatment. During the time she was with us she did start to calm down and showed signs of enjoying a limited amount of contact with us. Out of the blue Jeanne received a phone call from a lady to whom she had rehomed a cat before. 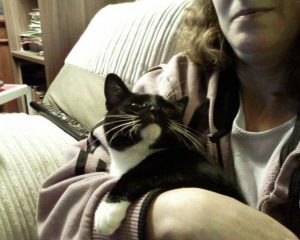 She was looking for a friend for her existing cat and had seen Polly on our website. This looked like it could be a very good match as the cat she had from Cat Rescue before had been almost feral and she had worked wonders with him. So with patience and lots of TLC from her new Mum, Polly has had her happy ending. 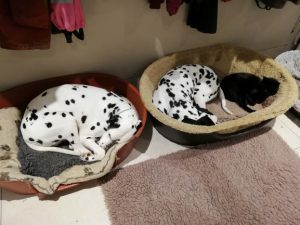 She is happily settled in with her new brother which shows that even the more challenging cats are very capable of adapting to a new home when given the chance to do so. 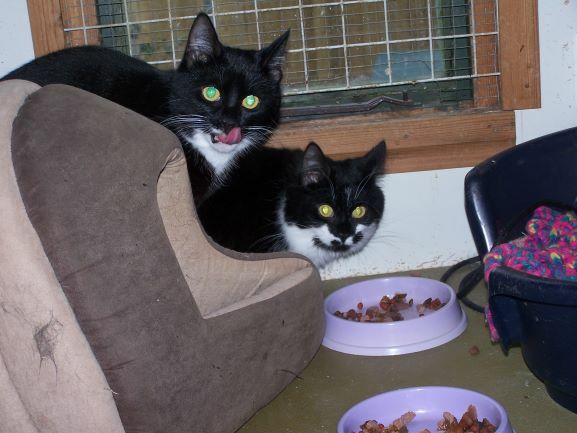 Polly and her new Mum – Feral? I don’t think so!! We adopted (Tiffany) now Jorja in November 2016, just thought we’d give you an update . Well after a timid three weeks Jorja became a valued and much loved member of our family. She’s a delightful happy and independent cat, hates baby cry’s and sudden noises, loves her brother Jasper, Dreemies and hunting. She’s excellent at hunting, moles, crows, mice, shrews, bats and once even debated bringing us a pheasant for a present but decided against it – luckily for us! We love her to bits especially at bed time where she snuggles up, purrs and dribbles until the morning. Thank you for letting us have our little girl no idea what we would do without her now! 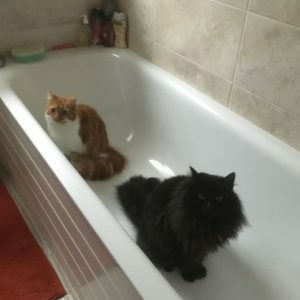 Here she is in the bath with her brother Jasper – no water involved! !